Home / For Visitors / 2019 Exhibitor List / HONG QING INTERNATIONAL CO., LTD.
An opportunity for job seekers with no diploma, no funds, no resources, or no connections to be the pop-up store/shop/stand owner! A perfect choice for: volunteer clubs and activities, orphanage support project, party catering, fair, and Christmas market. 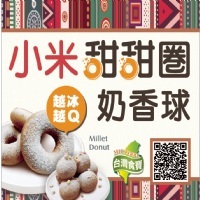 We offer: delivery-in-person service to group buying initiators/go-betweens throughout Taiwan, freshly fried & frozen millet doughnut supply, professional on-the-job-training. Via a startup with only very little money!